By Laura - Argentina - 21 Oct/02 - Viewed 2467 times. Yesterday it was Mark's birthday, the most southerly birthday he is ever likely to have. Unfortunately I couldn't arrange a birthday cake for him. We did buy some more chocolate though. There are chocolate shops here that sell lots of different flavoured bars of homemade chocolate. Each one that I tried was delicious, especially the mint liquor. We checked out of our hostel at about 12. When we left, Suzanna (who runs the hostel) gave us some small gifts, including an Argentine flag. We arrived at the airport rather early but it was worth it to get a window seat. On a clear day the views over Ushuaia are amazing and the mountain range seems to go on forever. The flight to El Calafate took about 90 minutes and when we arrived we wondered if there was actually a town nearby as the area looks so sparse. Fortunately there is and we found a place to stay at Los Dos Pi�os (the two pine trees) for A$35.00 a night for a double room with a bathroom and use of a kitchen. We have only managed to spot one pine tree so far though. It is very good value and the lady that runs it is very friendly and helpful. In the evening we went out for our most expensive meals yet to celebrate Mark's birthday. We were supposed to be taking the Navimag boat from Punta Arenas to Puerto Natalies, but Navimag emailed us to say it had been cancelled until further notice. We were not too upset because we had booked it a bit early and wanted more time to see the south of Argentina. Today we visited the Perito Moreno glacier. The glacier is only 80km away from El Calafate but the second half of the journey is on unpaved road so it takes about 2 hours to get there. We had paid A$50.00 each for the tour (arranged at our hotel) and the guide spoke brilliant English. On the way we found out that El Calafate is named after a berry which grows locally and the locals say that if you eat lots of them then one day you will return to Patagonia. The first view you get of the glacier is of the southern face and that is impressive enough. We took a boat trip, which cost a further A$25.00 each. It is also possible to hike on the glacier but that is rather expensive. The boat takes you to within 200m of the glacier. It is absolutely massive and occassionally there is a large cracking noise as a piece of ice falls into the water. It is very easy to take far too many photographs of the glacier. After the boat trip we were driven round further to where the platforms begin. 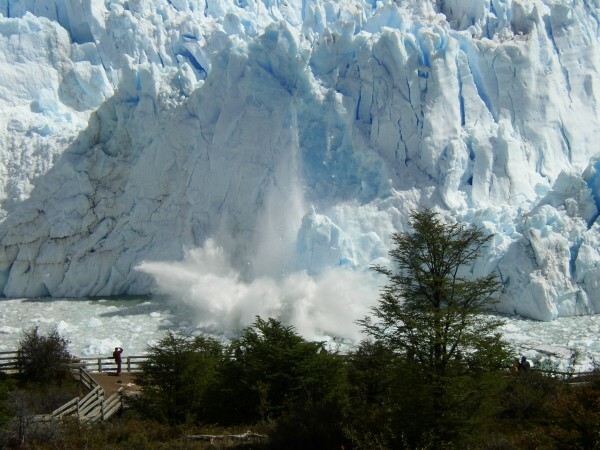 It is here that you get the first full view of the glacier and its full size becomes apparent. It goes back for as far as the eye can see. Apparently the glacier is 5km wide at the front and goes back for 14km. It covers an area of 237km square (although this doesn't quite add up), which is roughly the size of Buenos Aires. It is 60m above sea level and up to 120m below in some places. The glacier advances at 2m at the front and 40cm at the edges each day. It is difficult to describe or to capture in a photograph just how impressive and vast the glacier really is. We had plenty of time to view the glacier from each of the balconies. I would love to have the opportunity to view it from the air. In the evening we walked to Laguna Nime, a bird reserve a short walk from our hotel. The scenery there was stunning and everything seemed to have been blended in pastel colours. A short walk on a track brings you to a lake with several flamingos in it. It seems very strange to see them in the wild. On our way back we had our longest conversation in spanish so far with a farmer.